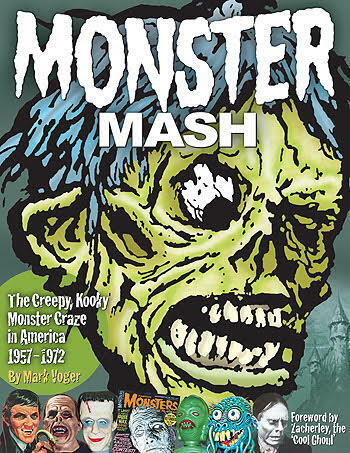 This week, TwoMorrows Publishing releases Monster Mash, a new full-color hardcover that time-trips back to the frightening era of 1957-1972, when monsters stomped into the American mainstream. Once Frankenstein and fiends infiltrated TV in 1957, an avalanche of monster magazines, toys, games, trading cards, and comic books crashed upon an unsuspecting public—and this book covers that creepy, kooky Monster Craze through features on Famous Monsters of Filmland magazine, the #1 radio hit “Monster Mash,”Aurora’s model kits, TV shows (Shock Theatre, The Addams Family, The Munsters, and Dark Shadows), “Mars Attacks” trading cards, Eerie Publications, Planet of the Apes, and more. "I believed in monsters as a kid. The evidence was everywhere," recounts Voger. "I saw my first "Dark Shadows" episode when I was 9, and fell deeply, madly in love with the character Josette after seeing photos of actress Kathryn Leigh Scott in Famous Monsters of Filmland magazine. The Monster Craze was an innocent, naive, fun time for us dopey little kids. We identified with those deformed, hated creatures who, after all, only wanted love. As someone who was a child during the Craze, my aim is to report on the era with the viewpoint of an eyewitness." 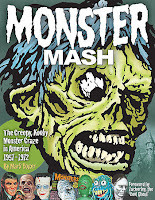 In addition to coverage of pivotal moments of the Monster Craze, this book has hundreds of full-color photographs and illustrations of the casts of Monster films and television shows, plus all the rare Halloween costumes, trading cards, board games, model kits, comic books, and magazines that had us running for our lives (and toy stores) in the 1960s. This full-color hardcover is 192 pages long, and retails for $39.95. It is available now in both print and digital editions, through TwoMorrows' website (www.twomorrows.com), comic and bookstores through Diamond Comic/Book Distributors, on Amazon.com, and through the company's app on the Apple and Android platforms.